There are approximately 150,000 cases of Acute Respiratory Distress Syndrome (ARDS) in the U.S. per year. The severity and survival rate for this disease vary greatly between patients. 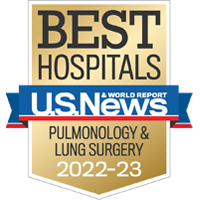 Therefore, the development of a diagnostic test predictive of clinical outcome may lead to a more personalized and effective treatment of ARDS. Scientists at National Jewish analyzed genome-wide transcriptional profiles of circulating neutrophils isolated from a prospective cohort study of 120 patients with sepsis-induced ARDS and healthy controls, testing if over- or under-expression of ISG by neutrophils was associated with worse clinical outcomes in patients with ARDS. A novel biomarker panel of three interferon-stimulated genes was identified, predictive of disease severity and prognosis. Analysis of the range of neutrophil ISG expression in ARDS patients was correlated with clinical outcomes. Using hierarchical clustering of expression, three distinct subject groups were identified with low, mid and high ISG expression and the three ISG accounting for the greatest variability in expression were identified (MX1, IFIT1, and ISG15). Samples were stratified by standard deviation from the mean and clinical outcomes were compared between patients with high or low ISG expression to those with mid-range expression. After adjusting for age, race, gender and BMI, patients with either high or low ISG expression had significantly worse clinical outcomes than those in the mid-range as determined by number of 28-day ventilator, ICU-free days, 90-day mortality and 90-day home with unassisted breathing. Up or down-regulation in neutrophil ISG expression could represent a “window” of vulnerability that places an otherwise healthy subject at increased risk for a period of days or weeks. While neutrophil ISG expression may be of prognostic value at the onset of ARDS, the potential exists for this marker to modify clinical care, either by alerting clinicians to the possibility of an unsuspected viral or autoimmune disease, or as a direct target for immunomodulation through administration of Type 1 interferons. The panel results may provide a method of determining treatment strategy, where the subject is administered a therapeutic effective amount of an ISG suppressing agent is the subject’s ISG expression level is greater than or less than one standard deviation from the mean as compared to the control. The inventors are currently validating this gene panel test using whole blood from ARDS patients, instead of isolated neutrophils.